Okunojima island used to be an old poison testing factory WWII. The island has a dark past but is now home to many rabbits/bunnies. The bunnies repopulated and now, it is bunny island! As you arrive from the ferry on bunny island, there will be a bus waiting at the dock. This is a free bus that takes you to the hotel on the island. When we visited the island, we saw a “free bus,” got on and figured out the rest later. NOTE: If you don’t take the bus, it’s a 20-minute walk to the hotel on the island. The hotel had bicycles rentals, a restaurant and souvenir shop. For 600JPY and a 1000JPY deposit, you’ll be able to rent a bicycle for 2 hours. I went with renting a bicycle and took a lap around the island. It’s a small island with the only traffic going to/from the hotel. I didn’t run into any vehicles so it was really easy and peaceful ride. It took an hour to ride around the island with a few adorable stops to feed bunnies. CRITICAL TIP: Buy bunny food before getting to bunny island. Bunny food can be found at the ferry terminal and at the Family Mart next to Tadounomi station. The bunnies are pretty friendly all over the island. Their ear perk up as soon as the hear the crumbling of a food bad and they’ll go up to you. There aren’t any trash cans on the island so keep your trash with you! They incentivize keeping the island clean. 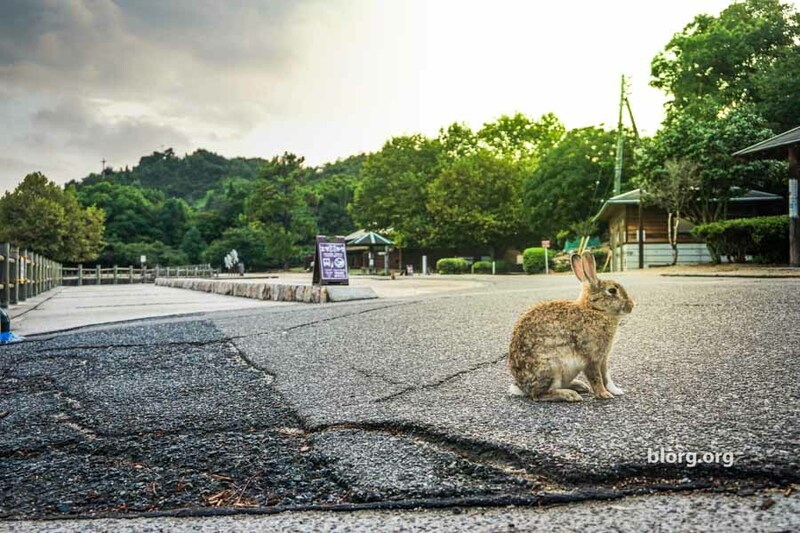 If you buy a bag of rabbit food, the wrapper becomes trash…but if you bring the wrapper back to the ferry station gift shop, they’ll give you a bunny island postcard for every wrapper you save.